This thin book is a mix of thoughts not only about designing games (“If a rule is optional, give it a name”), but playing them (“Take your turn, already”). Thin in word count (some pages consist only of a single sentence) but dense in information. I don’t agree with everything, but it often made me think. I definitely recommend Things We Think About Games for any designer (of either computer or physical games). 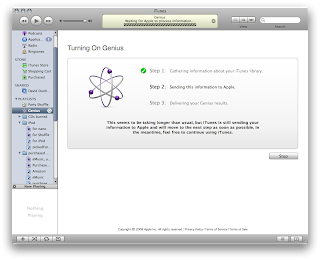 New in iTunes 8.0 is a “Genius” feature that’s supposed to show music related to a particular track. Of course, anything called “Genius” had better be smart. And this isn’t. 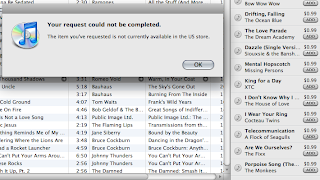 One search turned up songs I can’t buy. A number of cover versions don’t list the original (e.g. Gnarls Barkley’s version of “Gone Daddy Gone” doesn’t link you to the original by Violent Femmes). However, I really like this status message that I got during the initial process. Overall, Genius seems to do a better job than the “you may also like” feature that used to be on the iTunes store (in my case, I’m sure that’s because it knows about all the music I bought from eMusic). I might even buy some music from its recommendations! Apparently the new Zune will finally be able to tell time: “Additional updates to the software will add a clock.” You’d think this critical feature would have been in earlier Zunes, but maybe nobody at Microsoft waits for a bus while listening to music. I must have pulled out my iPod several times a week to see how late the bus was. I haven’t kept track, but I think this may actually be the third release, traditionally when Microsoft finally gets it.